A review of Motherhood in Early China, by Smadar Winter. Smadar Winter’s dissertation addresses motherhood as a crucial aspect of women’s history in early China, a period understood as the time from the Shang to the Western Han. Proceeding from the principle that motherhood is socially constructed, Winter tests previous scholarship on the issue by comparing it to the results of her own study of three different sets of sources: inscriptions on bronze vessels, ritual compendia, and two narrative sources, Zuozhuan 左傳 and Lienü zhuan 列女傳. Among the issues she addresses are the role of mothers vis-à-vis the patriline of the families they married into and the question of female oppression versus agency. In her useful review of previous scholarship, Winter regards with some reservation the view that there was not a strong and pervasive notion of gender difference in early China and goes on to argue against it in later parts of the dissertation. She likewise takes issue with what she identifies as the currently dominant scholarly attitude towards mothers and motherhood in early China, according to which motherhood in early China was a position that awarded great power and much importance to women. An example of her disagreement with earlier scholarship is her response to attempts by Catherine Despeux and Livia Kohn to highlight the “prominence of motherhood” in the Laozi 老子. Winter counters this claim with a well-conceived alternative reading that argues for the secondary importance of motherhood in the text. Chapter one begins with a review of scholarship on the epigraphic equivalents of the characters 母 and 女 in oracle bone inscriptions in order to explore early meanings of different terms for mothers and women. This overview is later complemented by a discussion of the word mu 母, which had a broader range of meanings than just “biological mother.” The main part of the chapter, however, is concerned with an analysis of inscriptions on sacrificial bronze vessels which address the role that women and, more specifically, mothers played as recipients of sacrifices and commissioners of vessels. Though scholars in some cases reach contradictory conclusions on the basis of the same evidence, the general picture is clear. Men vastly outnumbered women in both roles. In this way, “a woman is usually being ‘othered’ in the naming process, as the two main groups to which she belongs – her family of origin and the family into which she marries – each uses the other group’s state/lineage name, thus marking her as a permanent outsider in either group.” (p. 51) This interpretation is further bolstered by the fact that children referred to their mother according to pattern 2, while a mother would refer to her daughter by the father’s name, a sign of “othering” even by a woman’s own children. Overall, Shang and Zhou bronzes convey the impression that women were largely excluded from the social practices and symbolic representations that these artifacts reflect. Yet, one vessel type is an exception to this rule. A small number of dowry vessels from the late Western Zhou, which were made either by a woman alone or jointly by a woman and her husband, might be a “rare trace of a bond between mothers and daughters.” (p. 69) The purpose of such vessels was possibly to serve as sacrificial vessels to the husband’s family, yet Winter cautiously concludes: “I would still venture a guess that as dowry vessels were not designated as zun vessels, the woman who brought them with her as dowry might have retained some measure of control over their use, thus lending her a position of power, relative to the size of her dowry. If this conjecture is correct, we can see that while the greater bulk of transfer of property to daughters was done through fathers (who made most dowry vessels), mothers too played some part in transmitting family property to their daughters.” (pp. 71–72) The chapter concludes with a number of interesting questions awaiting further research. In chapter 2, Winter engages with the idealized stipulations concerning mothers in the ritual compendia Yili 儀禮 and Liji 禮記. Contrary to what one may expect, Winter considers the disparate nature of these texts an advantage. “Because the ritual manuals include a heterogeneous body of works compiled over an extended period of time by different groups of people, they can serve, I believe, as reliable witnesses to persisting attitudes towards mothers and motherhood held in early China.” (p. 91) From her analysis of the complicated gradations of mourning rituals in the “Sang fu” 喪服 chapter of the Yili and some pertinent parts of the Liji, Winter concludes that “the bond between mother and child is mediated through the father.” (p. 97) This is borne out by several further observations. For instance, it is stipulated that step-mothers had to be mourned like biological mothers because their relationship to the father was similar to that of the biological mother; foster mothers were to be treated in the same way as biological mothers if this was demanded by paternal “command” (ming 命); and a divorced mother was not to be mourned because she was no longer considered a mother. Besides stories about unsafe mothers, Zuozhuan and Lienü zhuan also offer less disturbing, though no less complicated depictions of motherhood. Some Lienü zhuan narratives place great emphasis on the power of mothers to effect a moral transformation (hua 化) of their offspring, a capacity attributed among others to Jiang Yuan 姜原, the mother of the legendary Zhou ancestor Lord Millet (Hou Ji 后稷). But even in such an elevated role, a woman’s importance can be severely restricted, as Winter perceptively points out. “To be an agent of transformation in another person’s life is a position of great power, and by awarding mothers this position, the work clearly ascribes mothers great importance. But […] the transformation that the mother brings about in her son’s life allows the son to start his road towards adulthood and towards his participation in the social order of adult men; this, in turn, means that he moves away from his relation with his mother. The importance of the mother is, therefore, by this very transformation, restricted.” (p. 170) An analogous picture emerges from Winter’s examination of mothers as educators. The maternal influence was only supposed to last for the first few years of a son’s life, after which point he was expected to develop by himself, a process which was tantamount to a gradual distancing from the mother. In her conclusion, Winter revisits debates about two paradigms in the gender history of early China: “woman as victim” and “woman as agent.” While she acknowledges the importance of the latter, she reminds her readers that “women’s agency was always defined in the service of male interests.” (p. 215) To acknowledge this is crucial so as to not to forget the “forms of oppression from which early Chinese women have suffered.” Consequently, Winter argues against “a neutral-to-positive tone which seems to be saying: Yes, there was oppression, but women were still able to lead meaningful lives and fulfill their humanity in the roles that subordinated them.” (p. 216) In the conclusion, Winter also suggests further topics for future research. One question she raises is whether a separation existed between the power and status of women in early China. A study of this question “might yield the intriguing conclusion that in early China there was, perhaps deliberately, a fracturing of power and status of women: power went to wives, status to mothers” (p. 212). Lastly, Winter notes that an investigation into motherhood has perforce to be accompanied by a complementary study of fatherhood. Smadar Winter’s dissertation adds further nuance to debates by such scholars as Zhou Yiqun, Michael Nylan, Lisa Raphals, Paul Goldin, and Bret Hinsch about the roles as well as the power and status of women, and more specifically about mothers in early China. With her discussion of bronze inscriptions, Winter also explores a body of source material which, so far, seems to have been seldom utilized in studies of gender history. Scholars of early Chinese society, culture, and gender history will eagerly await the publication of the monograph into which Smadar Winter will hopefully soon turn her thesis. Yin Zhou jinwen jicheng 殷周金文集成. Ed. Zhongguo kexue yanjiuyuan kaogu yanjiusuo 中國科學研究院考古研究所. 18 vols. Beijing: Zhonghua, 1984–94. The University of Chicago. 2013. 231pp. Primary Advisor: Edward L. Shaughnessy. 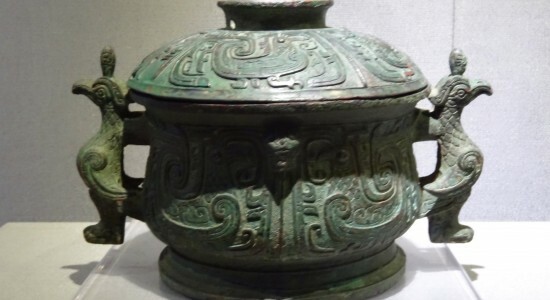 Image: Gui unearthed in Shaanxi Fufeng. Wikimedia Commons.